Nascer do Sol, Chizavane Mozambique. 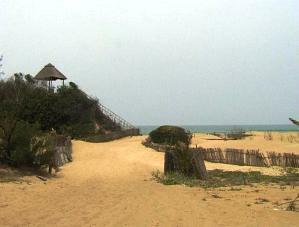 The turnoff to Praia de Chizavane is about 28 km north of Xai­Xai. 10 km further on a sandy road the magnificent resort of Nascer do Sol is reached. The spectacular Bay of Chizavane offers white beaches and beautiful tidal pools for safe swimming. The resort is set on one of the most beautiful spots on the Mozambican coast and is the ideal place for a family holiday. The Bar and restaurant is situated in a restored Portuguese style building with spectacular views of the ocean. Here you can sit on the veranda and while enjoying an ice cold drink you stand a good chance of spotting a migrating whale or two. 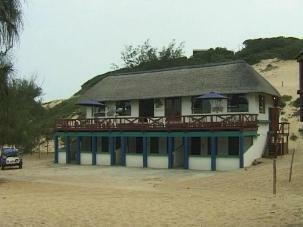 Nascer do Sol offers accommodation in very neat one and two bedroom self-catering log cabins overlooking the ocean. The en-suite cabins are individually named, for example Starfish, Sea horse etc. and sleep 4 to 8 people. The cabins are neatly decorated, fully equipped and boast a deck from which you can admire the beach and ocean. A shady campsite is set between the dunes overlooking the sea. The campsite offers already erected tent and a lapa where food can be prepared as well as neat ablution facilities with hot and cold running water and flush toilets. Rooms for overnight stops are also available on a dinner, bed and breakfast basis. Nascer do Sol with its friendly hosts is a beautiful resort and definitely worth a visit.